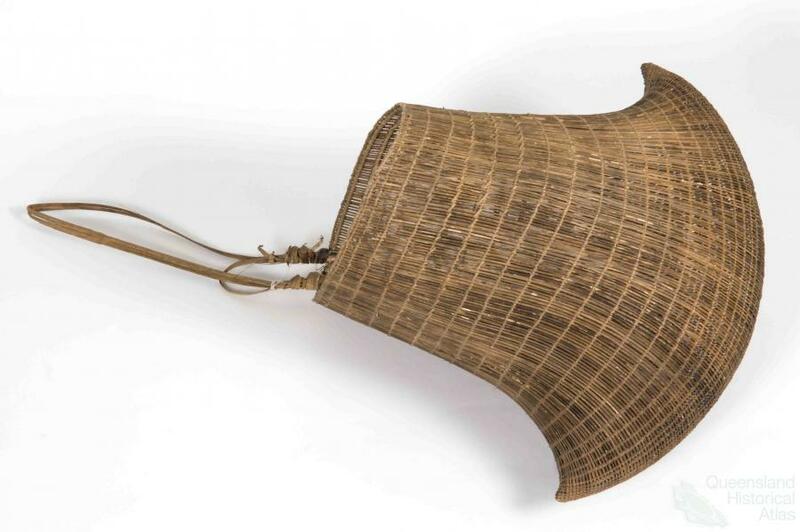 These distinctively shaped baskets are unique to the Aboriginal peoples of the rainforest region between Port Douglas and Cardwell. They were once an important trade item in the region, with different sized baskets being used to carry fruit, seeds, infants and possessions; to process seeds, and even to carry human remains. This particular basket was sold to Queensland Museum in 1916 by Joseph Campbell, a supervisor of Aboriginal labourers on a cotton plantation. Description: Basket, large and plain bicornual basket made from woven lawyer cane. Basket had remnants of cotton seeds and pods found inside.